Without a doubt, the most crucial performance variable in the Filipino martial arts of Arnis Kali Eskrima is striking. If you can strike fast and hard, then you have an edge over your opponents. Louis Lim executing follow-through strike number eight in transition. In this post, we will explore tips on how to strike fast and hard in Kali Eskrima. These tips will help you train your arm muscles and deliver a strike properly so it becomes faster and stronger in every training. If you have to hit someone, make sure that it counts. Now, to do this, you have to hit them hard. If you’re legally justified to do so, then hit them with adequate force and power that it’ll knock them down, stopping them from attacking you. If you’ve trained to hit forcefully, you can choose to hit with less force when you need to. But if you have never trained before, then you just do not have that choice. This is the time to learn to hit hard. If you own a sharp weapon and have an accurate strike, then you may not always have to hit hard; however, you do have to be quick. In Kali martial arts schools, we train with both blades and impact weapons. If you cannot perform a quick strike recovery, you’d be in big trouble! Leaving yourself exposed for long will give your opponent an opportunity to defeat you. But other skills aside, if you’re quicker, you have a better chance of winning the fight. This is proven in competitions, and it is highly established in self-defence. Eskrima practitioner practicing fast striking using the twelve basic strikes. Let’s discuss some effective methods for learning to strike fast and hard. Whether it be for self-defence or competition or both, the methods below will enhance your striking skills. To attain the full power of any martial art technique, you first need coordination. When you’re coordinated, your technique will be very effective. Your mechanics will become adequately efficient by repeating them. With repetition, you’ll become more familiar with the moves. You have to know the movement so that you can enhance for power and speed. When you know the movement; the speed will just come naturally. So if you’re attempting to develop speed with your strikes, then go slow first and coordinate before adding speed. When you’re consistent with your movements and have gained enough muscle memory, you should push yourself further to getting faster. Before, practitioners used to make use of a metronome to develop and measure speed. With this, you can establish a time interval of beats and attempt to finish your strike between the beats. But you can now utilise a par timer for just the same thing though. You can download a shot time application to your smartphone. Set the time to beep with an interval sufficiently long that you finish your strikes with excellent form. Shorten the interval gradually and continue your drills. Never shorten the interval until you can consistently finish your strike. Don’t shorten the time until you have performed the technique many times in a row. With this drill, you’re squeezing the time and reaching to finish your movement in less time. This drill will make you a better fighter, so do not cheat and be honest with yourself when it comes to finishing the moves in time. The main purpose of this drill is that you are testing your speed quantitatively and making direct adjustments as the drill is repeated. This instant feedback during practices is important. It will certainly make you quicker. Always maintain the movement’s integrity. Ensure that the motion range for every repetition is the same; otherwise, you’re not getting faster anyway, you are only doing less. If a strike is shortened, then the power required to make it effective is reduced. 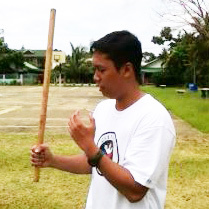 Eskrima master practicing follow-through strikes using the twelve basic strikes of Balintawak Eskrima. That’s wrong, and in fact, you may find cooperation between speed and power, but you will be at an advantage when you train in the entire movement and push yourself to boost your speed only. If not, the effectiveness of the speed may be sacrificed. The appropriate body mechanics will let you generate excessive force. When you’re using the proper body mechanics, in executing your strikes, the muscle groups in your body are in sync and work together like a chain. Rather than using your arm and shoulder muscles alone to attack, you can utilise your arm, shoulder, hips, back and legs at once in a chain. Think about how a baseball pitcher will make use of his or her whole body to throw a baseball. Every movement of the player’s body is in sync to culminate in a strong and powerful throw. If you practice hard, you develop the proper mechanics, and you will hit much more powerfully. Learn to strike right and test your strikes by striking a specific target. Change your mechanics every time you hit and compare the result. It is quite simple; you should hit something hard so that you get skilled at striking hard. To strike hard, you should practice follow-throughs. You won’t ever hit a home run if you just bund the ball. In order to follow through, you should keep on striking through the target. Do not stop at the target’s surface. Continue to fast-track your strike until the target has been passed through. Winning sprinters (except Usain Bolt) continue to sprint at their maximum speed until they’ve passed the finish line. If runners only aim to reach the finish line, then they will start to slow down before reaching it, and so lose power. This analogy is true of strikes in Escrima Kali. You strike through a full motion range to exercise hitting hard. Allow your strike to continue until your arms wrap around your body or they reach a stopping point. It will also be – ideally – in a loaded or chambered position to strike again. Louis Lim performing striking rope drill using follow-through strikes. By doing this, you’ll find that you engage your kinetic chain more and you will know how to coordinate it. Later, if you abbreviate the strike when you use it, you’ll still be able to use those techniques. But if you attempt to shorten the strike initially, you may never learn to use them fully. Including footwork to your strikes will let you develop even greater force. Think about starting to strike somebody. That is what footwork can do for you. With proper timing and with your footwork, you can build momentum and move that momentum through the kinetic chain, your blade or weapon, and to your target. Test the timing to make this work. An excellent starting point is to time your strike’s impact with your step. You’ll see that timing the strike with the landing of your rear or lead foot has distinct qualities, yet both are helpful. Use heavy rattan kali sticks sometimes for your striking practice. The rattan sticks are our main training tools, but heavier sticks such as kamagong and bahi sticks or metal pipes, batons made of plastics, etc. can be extremely helpful for your training. The striking rope drill at different angles help develop striking speed and footwork. The additional resistance of these best escrima sticks will aid you to develop more strength and utilise much better methods to move them. When you use your regular sticks back, they’ll feel like nothing. You can hit harder and move them faster. Avoid strikes that put too much pressure on your connective tissues and joints otherwise; you will get injured. Also, tire training is an excellent tool for hitting hard. Striking a tire can help you gain more power, grip strength, and stamina. Repeat your strikes with the proper techniques and adjust for the top results. When you begin your tire training, always remember to work up little by little. Provide your joints with enough time to adjust, and protect your grip if your skin is tearing. Over many weeks and months, work up from 50 sets to 100, 200, or even 500 repetitions for every set. Following a long period of tire training, you can include the use of pipes or heavy kali escrima sticks to strike the tires.